What Is A Sentence From a Book (or two) You Love? I was thinking recently of a variety of aspects of books that I love, including plot, theme, and character. As I was considering these elements, I realized that some books have extraordinary sentences. These lines might not encapsulate the entirety of those books, but they are beautiful and powerful. “It is a far, far better thing that I do, than I have ever done; it is a far, far better rest that I go to than I have ever known” (307). The second offering is from A Soldier Of The Great War by Mark Helprin. This novel is, in my not too modest opinion, one of the absolute best novels ever written. With this book, Helprin takes his place among the pantheon of literary giants such as Shakespeare, Dickens, Cervantes, and Tolstoy. I am sure I will continue this idea as a series, but this little post will serve as a beginning. So, now I ask everyone who reads this: what are some of the most beautiful and important sentences you have read in books? Dickens, Charles. A Tale of Two Cities. Wordworth Classics. 1993. Helprin, Mark. A Soldier Of The Great War. Perennial. 2001. Guran has been one of the three major contemporary editorial contributors to the genre, most recognized for her excellent work on the Prime Books annual “Best of ” collection, The Year’s Best Dark Fantasy and Horror, but also for her prolific work on countless anthologies that for decades have served up some of the more interesting and innovative Horror anthologies – often with a delicious side of Dark Fantasy and fairy tale influence. She is, by far, my favorite American Horror editor. And in times when it is increasingly hard to get our hands on British Horror, her collections have offered a complimentary creative contrast to Ellen Datlow, whose influence continues to showcase better constructed Horror with Literary inclinations, but without that feel of adventure. Guran has been the “heart” of the genre, going for the emotional center. I hope that the good wishes that many have had for other people during this holiday season continue throughout the new year. Please remember that we are all interconnected and all people matter. All of humanity, all of the creatures of the world, and all of the planet are important. Please remember that our fates are connected, and try to show kindness and decency. 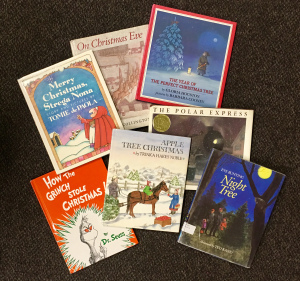 Here is a wonderful selection of children’s books from Jennie! 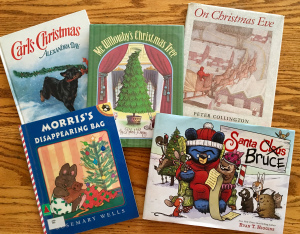 I want to share with you my favorite Christmas books. I love books, and I love reading to children. After a gazillion years, these are the ‘tried and true’, stories that children love. Me, too! Grab tissues, laughter, and wonder, and some history. Some books you will recognize. Others might seem new, but they’re not— they’re just better. The first time I read The PolarExpress, by Chris Van Allsburg was was in 1985, when the book was published. I was at a huge family Christmas gathering. Someone put the book in my hand and asked me to read it to the crowd. This was a new book for me, and as I read the words I was on that train ride. The ending was hard to read aloud with my heart in my throat. The movie is good, but the book is superior.